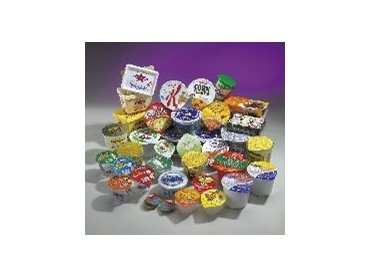 Chadwicks , a member of the Condalkin group and globally a leading producer of die-cut lidding primarily for the food and beverage industries has undergone a programme in down-gauging its heat-seal lacquered aluminium offering to the market. John Savage (Manager - Pacific Region) explains that some years ago the standard gauge of aluminium was 50 micron. In recent years, that standard reduced to 38/40 micron. In these days of environmental issues and rising material costs, Chadwicks has taken the initiative to provide an option of 30 micron foil representing a saving to its customers and a responsible stance as far as the environment is concerned. Lighter gauge foil can also be sealed at a lower temperature and a shorter dwell time representing energy savings plus higher production output. Savage adds down-gauging foil to 30um has been very successful in Europe especially for smaller sizes - say up to 97.5mm. For larger sizes it is still possible. In all cases we will provide our customer with enough samples to run a machine trail to make their own judgment. Quite often our customers have run 30 micron foil without noticing any difference in performance.